Schools may bring up to 1 team to compete. Teams must consist of 3-6 students. The mat used will be Trash Trek Challenge. Registration is due by April 24, 2018. Late team registrations will not be accepted. At this time, registration for the Lego Robotics Tournament and STEM Tournament is only open to students who attend a BCOE After School Program. Each school should send one team with built robot. Teams should consist of 3-6 students/school. There will be a DJ intermittent dance breaks – extra points for kids who get up and dance! Sites are responsible to coordinate transportation to/from event. Please insure you have submitted all appropriate paperwork and follow BCOE field trip procedures. The tournament will NOT be providing snacks or water bottles however you may bring your own. Students are permitted to eat in the cafeteria at your discretion. A few laptops with NXT software will be available for teams. You are encouraged to bring your own however. Students should review the tournament rules before attending competition. Robots brought to competition should be clearly marked with school’s name. It is recommended robots are transported in a plastic tub. The competition mat used will be the TRASH TREK challenge. The missions are the last few pages of the PDF. It is suggested students practice a few missions rather than all of them to gain the most points. 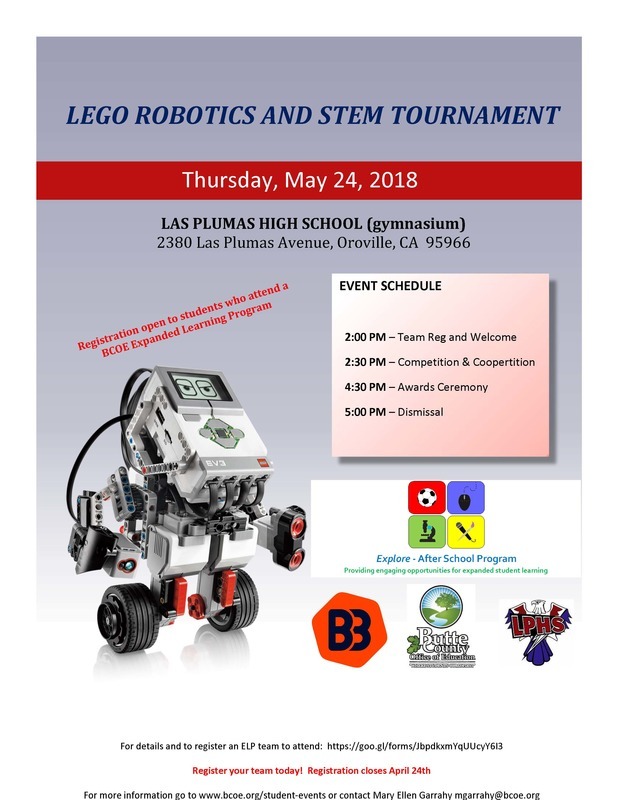 THE LEGO ROBOTICS TOURNAMENT AND STEM TOURNAMENT IS SPONSORED BY BUTTE COUNTY OFFICE OF EDUCATION STUDENT EVENTS, BUTTE BUILT BOTS, LAS PLUMAS HIGH SCHOOL, AND EXPANDED LEARNING PROGRAM.